The Sarasota County Sheriff’s Office is currently investigating an Armed Robbery that occurred on 5/3/18 in Sarasota. Deputies first responded to the Five Guys restaurant at 5354 Fruitville Road at 11:08 p.m. According to store employees, three black males entered the business wearing masks and carrying guns. The suspects took money from the safe as well as cell phones and wallets from employees. A witness in the parking lot reported they may have been travelling in a black Nissan Altima. The suspects are all described as being between 5’9” and 5’11” tall with medium builds. They were wearing dark clothing, masks and gloves. Sarasota, Fla – On February 10, 2017 at 10:42 pm, the Florida Highway Patrol investigated a four vehicle crash on State Road 610 east of Lockwood Ridge Road. Katarina Huffman, a 20-year-old female, was driving a 2005 Ford Mustang eastbound on University Parkway in the inside lane. A 2015 Nissan Altima, driven by Patrick Wiese, a 56-year-old male was traveling westbound on University Parkway in the center lane. A 2015 Honda, driven by Ariana Padron, a 20-year-old female, was traveling westbound on University Parkway in the center lane behind the Nissan Altima. A 2017 Freightliner truck, driven by Pedro Emilio Cardoza-Gome a 42-year-old male, was traveling westbound on University Parkway in the outside lane. The on-scene investigation revealed the 2005 Ford Mustang crossed the grass median, for reasons that remain under investigation and entered the westbound lanes. As a result, a traffic crash occurred between the Ford Mustang and the three other vehicles involved. Katarina Huffman was pronounced deceased on scene. In February 2018, a new witness contacted the Florida Highway Patrol advising that an unknown vehicle, described as a black or grey Nissan Altima or possibly a Honda two-door veered toward the Ford Mustang as it traveled eastbound on University Parkway. In doing so, the front left of this unknown vehicle struck the right front of the Ford Mustang causing the Ford Mustang to cross the median and travel into the westbound lanes. The unknown vehicle was additionally described as having a black bumper sticker with white writing on the bottom right bumper. The unknown vehicle fled the scene after making the initial contact with the Ford Mustang. If anyone has any information regarding the unknown vehicle or any information regarding this traffic crash, please contact Crimestoppers at 941-366-TIPS. On 1/10/18 at 1:30am, two black males wearing masks entered the home at the 8100 block of Porto Chico Avenue in North Port Florida. As a result 19-year-old Trent Bartol-Thomas was shot and killed. The suspects were seen leaving in a light colored vehicle. On 12/21/17 at 0330 hrs, the two listed suspects smashed a window to the Roll your own Tobacco located at 5761 Beneva Rd. Video surveillance captured the two unknown male suspects wearing gloves, ski masks, and hoodies. They were carrying a suitcase and backpack. These suspects stole several e-cigarette products. The one suspect is wearing a shirt with the words "If it aint't XO then it gotta go" in a circular pattern on the back. On 12/14/17 at 1100 hrs, the suspect entered Kay’s Jewelers located at the UTC mall in Sarasota. Upon contact with the sales associate, the suspect requested to see two diamond engagement rings. While holding two of the rings, he asked to see a third. At that time, the suspect snatched the ring out of the associate’s hand and fled the mall. The suspect is described as a 45-55 yr old Hispanic male, 6’0” 225 lbs. He was wearing a blue/white plaid shirt, dark pants, and black shoes. The suspect left in a 2000’s silver Chevy compact car with black rims. The North Port Police Department is asking for the public’s help to identify the shooter in an early evening shooting on November 16th. Officers were called to the scene of one person shot on Herbison Ave. The suspect had already fled. Officers and K9 Officers attempted to locate the suspect, however were unsuccessful. If anyone has any information related to this crime please contact Crime Stoppers of Sarasota by calling 941.366.TIPS or online at www.SarasotaCrimeStoppers.com. On 11/5/17 at 1345 the listed individual was observed on video stealing items from the Macy's Department store located at University Town Center Mall. The suspect stole the items from the kiosk display shelve and concealed them inside of a blue and white stripped bag. 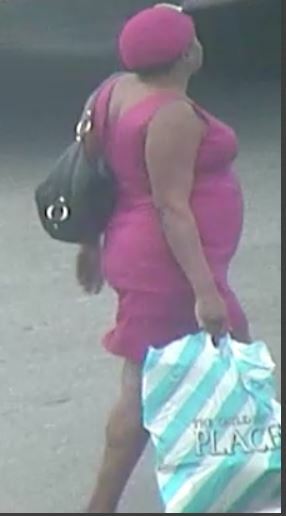 The suspect is described as a b/f, approximately 5'6". 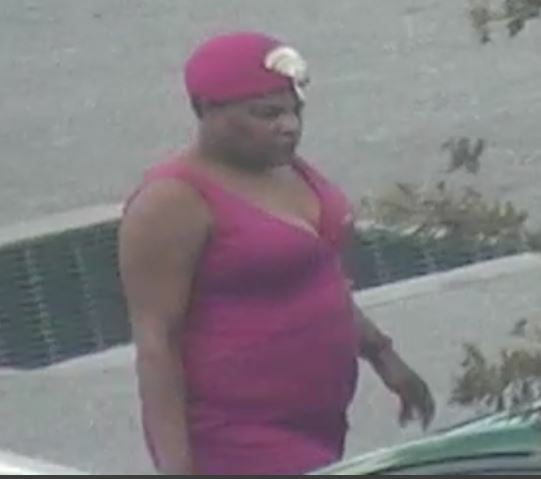 She was wearing a purple colored dress with a matching hair wrap and a large black purse. 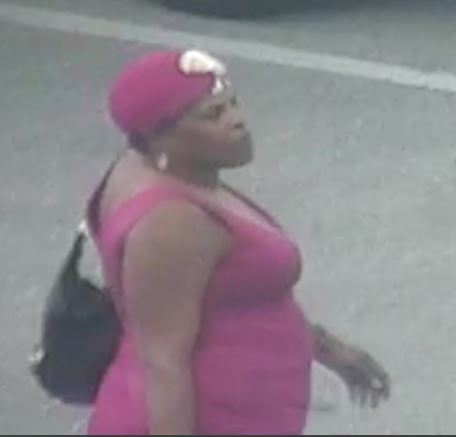 If you are able to identify this person and would be interested in a reward, you are asked to contact Crimestoppers by calling 941.366.TIPS (8477). Armed Robbery 5100 Fruitville Rd. The Sarasota County Sheriff’s Office is asking for the public’s help to identify a suspect who robbed a Sarasota gas station early Friday morning. Deputies were called to Shell at 5100 Fruitville Road, at 3:30 a.m., for reports of an armed robbery. According to the store clerk, the suspect approached him while he was standing outside and led him into the store at gunpoint. The suspect demanded cash and fled on foot westbound on Fruitville Road. Deputies and Venice Police Department K-9 units responded and attempted to locate the suspect however, were unsuccessful. The suspect is described as a white male in his mid 30’s with an average build, approximately 5’10” tall, and 180 lbs. At the time of the robbery, he was wearing a black t-shirt with a light-colored long sleeve shirt underneath it. The suspect also had a t-shirt wrapped around his face and wore work gloves. Update: Another robbery occurred in Manatee County on 10/1 at 2340 hrs, at the 7-eleven on Pearl Avenue/US 41. The suspect, a black male with dreads, is likely the subject from the robbery in Sarasota. he was wearing the same clothing and used the same verbiage when demanding cash from the clerk. The Sarasota County Sheriff's Office is currently conducting an Armed Robbery investigation. Deputies responded to the 7-11 store located at 5420 N. Lockwood Ridge Road in Sarasota, shortly before 6:30 a.m. Saturday morning for reports of an armed robbery. The suspect was armed with a silver handgun and fled the store with the cash drawer. The suspect fled westbound on DeSoto Road in a silver four-door sedan. He is described as a black male in his early twenties, wearing a black hoodie, dark jeans, black sneakers and gloves. Anyone with information related to this incident is asked to contact Crime Stoppers by calling 941.366.TIPS (8477).